Sunday morning. I had slept on the floor all night with a blanket that only half covered me. I’m surprised how good my back felt the next morning. I had always thought that sleeping on your back being good for you was an old wives’ tale, but my back felt great. I’ll have to try it again sometime. Kris and I ran over to Safeway and bought a few things for breakfast, which when we came back, Lindy cooked. Breakfast wasn’t terribly exotic, but Lindy’s fruit-filled wheat pancakes were excellent. The big caveat of the morning was that Kris was scheduled to go to work at eleven. Luckily, Kris works with some cool people and he was able to get the day off. We went down to the Pike Place Market and wandered around for a bit. There’s a little piroshky joint down there called Piroshky, Piroshky. I had a beef and cheese piroshky that was =so= delicious. After I bought the piroshky, I wandered around near the shop and found a whole area of the building with cool shops that I had never known about. Kris noticed some guys singing in front of the Starbucks next door, so we wandered over and listened to them sing. 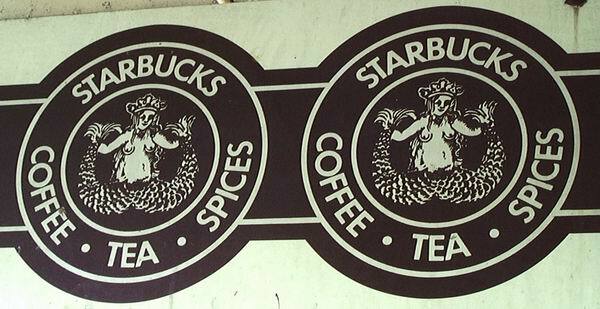 Kris pointed out that it was the first ever Starbucks and that the logo hadn’t been changed from it’s original form. As we walked away, we were joking about how none of us could remember a time when those guys weren’t standing in front of that Starbucks and belting out some tune. Moments later we noticed a painting in the market of the Starbucks. The painting featured the singers, doing their thing. We wandered around some more and checked out a few shops, but really there wasn’t a lot to do. We headed back to Kris and Lindy’s flat and hung out for a little while before Morah and I left. In a brief lapse of foresight on my part, I didn’t think to get instructions from Google Maps as to how to get back to the freeway. Kris tried to explain it to me, but being a visual person, I wasn’t sure I would be able to follow his instructions. We made it without any trouble, and so began our longest journey of the trip. In total, our driving time from Seattle to Spokane was about four hours, but we did stop in Northbend again for dinner. Of course, my mind wasn’t on dinner as we pulled off the freeway. I wanted to go back and look for that ENG mic. I wandered around on the onramp for a few minutes, but I couldn’t find the mic anywhere. I suspect whoever left it there realised their mistake and returned so as not to get fired. And that’s about it. I had to go to work at six the next morning, but it was a relaxing and enjoyable holiday overall.